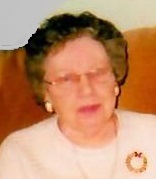 Ruth Helen (Redding) Hornyak, 95, of Oneida, passed away peacefully on Wednesday, February 6, 2019 at Oneida Healthcare Center ECF. Born March 19, 1923 in Oneida, she was the daughter of William and Ruth (Helmer) Redding and attended Oneida City Schools. Ruth helped raise her three younger brothers, Frederick, James and William, after the untimely death of their father. She was very hard working, going to work at the former Smith-Lee Company at the age of sixteen to help support her family and to help fill in for the young men who went overseas during WW II. After raising her five children, Ruth worked at Oneida Limited, retiring after twenty years of service. Ruth was very well known and respected in the Oneida area and will be greatly missed. Ruth was predeceased by her parents, her brothers, and her husband, Alexander “Steve” Hornyak. She is survived by her children, Steven (Jennifer) Hornyak of Kirkville, Barbara Fellows of Clark Mills, Michael (Arlene) Hornyak of Canastota, Thomas (Sue) Hornyak of Oneida and Joseph (Theresa) Hornyak of Cleveland, NY; nine grandchildren, Candi (Jeff) Clark of Washington State, Jessica Colvin and fiance’ Richard Hastings of Durhamville, Kyle Hornyak of Ithaca, Steven (Sophia) Hornyak of Lancaster, PA, Megan Hornyak of Clark Mills, Sarah Hornyak and fiance’ Ryan Warner of Sherrill, Abby Hornyak of Vernon Center and Alexander and Andrew Hornyak of Oneida; a sister-in-law, Caroline of Michigan; and several nieces and nephews. Funeral services will be held at the convenience of the family at Coolican-McSweeney Funeral Home, 322 Washington Ave., Oneida. Interment will be in Valley View Cemetery, Oneida. There are no public calling hours. Ruth’s family would like to thank her caregivers while she was still at home and the staff of Oneida Healthcare Center ECF, second floor, for their kind and wonderful care.